Flexi, 8.5 x 11.75 in. / 40 pgs / 22 color. 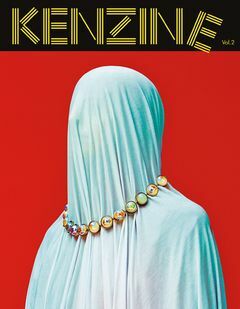 Edited by Maurizio Cattelan, Pierpaolo Ferrari, Humberto Leon, Carol Lim. 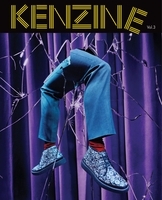 Kenzine is the exciting collaboration between the magazine Toilet Paper and the Parisian clothing line Kenzo. Japanese designer Kenzo Takada, founder of Kenzo, is known for his meld of distinctively Asian and Japanese-influenced style with Parisian high fashion. In 2011, Humberto Leon and Carol Lim, the founders of the Opening Ceremony fashion retail store and private label collection in New York, were appointed Creative Directors of Kenzo. The duo has since revitalized the label with their unique, multifaceted experience from the fashion world and avant-garde aesthetics. Toilet Paper, by artists Maurizio Cattelan and Pierpaolo Ferrari with art direction by Micol Talso, is a picture-based magazine that explores surrealistic narratives. Kenzine II is published in a limited run of 2,000 numbered copies. 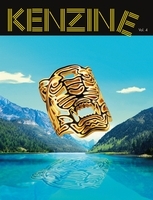 Featured image is reproduced from Kenzine: Volume II. Edited by Maurizo Cattelan, Perpaolo Ferrari, Humberto Leon, Carol Lim. FORMAT: Flexi, 8.5 x 11.75 in. / 40 pgs / 22 color.